SOLD OUT - STANDBY TICKETS WILL BE AVAILABLE FOR PURCHASE AT THE DOOR ON A FIRST-COME, FIRST-SERVED BASIS WHILE SUPPLIES LAST. 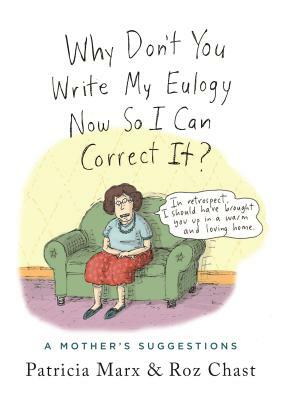 Get tickets to see Roz Chast (author of New York Times bestseller and 2014 National Book Award Finalist, Can’t We Talk About Something More Pleasant?, and New Yorker writer Patricia Marx discuss their new book! Patricia Marx has been contributing to The New Yorker since 1989. She is a former writer for “Saturday Night Live” and “Rugrats,” and the author of several books. Marx was the first woman elected to the Harvard Lampoon. She has taught screenwriting and humor writing at Princeton, New York University, and Stonybrook University. She was the recipient of a 2015 Guggenheim Fellowship.